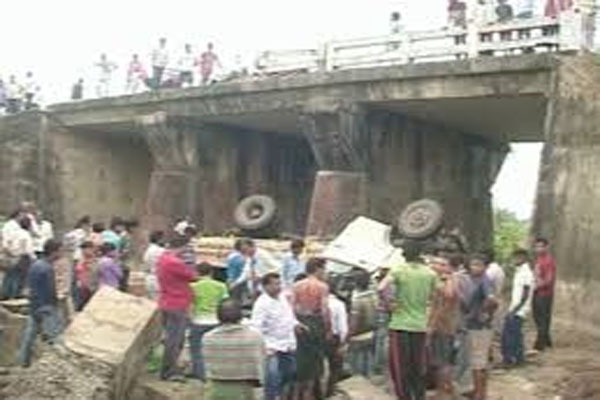 Bhubaneswar: A driver of a LPG cylinder loaded truck was critically injured as the vehicle fell off a bridge near Bishoi police station in Mayurbhanj district early this morning. The injured driver has been admitted to the Rairangpur hospital in a critical condition. According to reports, the truck carrying LPG cylinders was going towards Baripada on the National Highway when the driver lost control over it. The vehicle fell ofg the bridge into a deep ditch. The injured driver was rescued and rushed to a hospital by locals. He was then shifted to the Rairangpur hospital as his condition deteriorated furher.